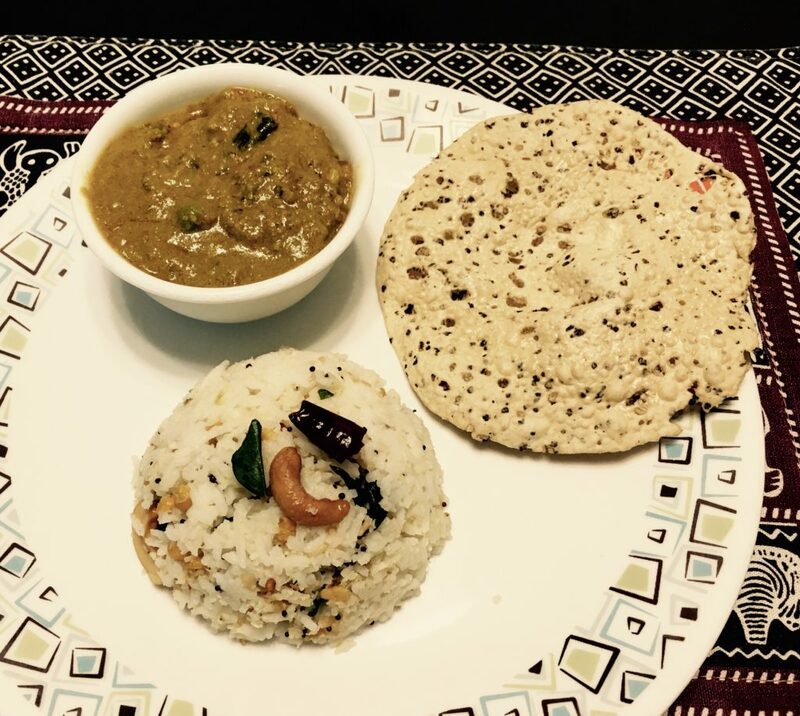 A coconut flavored rice tempered in ghee with nuts and mild aromatic spices. It's a lovely combination with spicy curries like korma or can be even served by itself. I stumbled upon this heavenly combination of Coconut rice and Korma at District 6 Pub Brewery & Kitchen at Malleswaram, Bangalore. Now it is a regular order for us whenever we go there. They serve this combo with a side of appalam. It is missing here in my pic but I made up for it with a Punjabi udad papad. Not bad! The korma recipe is for another day. Coconut rice tastes best when made with left-over rice. Rice which has been left cold for hours is more drier and reacts differently to the tadka and spices than warm rice. So, the next time you have left-over rice with you, you know what to do :) If you really like coconut, then just cook this super simple rice dish and enjoy the simple and delicious pleasures of life. Heat the ghee/oil and temper it with mustard seeds. Add the sesame seeds, chana and udad dal, cashews along with the red chillies and stir them till the dals change color to a light brown. Add the curry leaves, ginger, hing and fry it more for a bit. To this tempering, add the coconut and mix it well. Finally, add the rice and season it with salt and mix well.